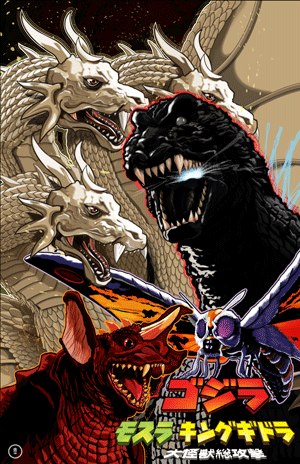 This month we are talking about Godzilla · Mothra · King Ghidorah: Giant Monsters All-Out Attack (2001). This month, we are finally talking about one of my favorite films ever: the polarizing 2001 Shusuke Kaneko joint, Godzilla · Mothra· King Ghidorah: Giant Monsters All-Out Attack! This movie is consistently at the top of my kaiju lists, but it’s not perfect. Bryan and Rachel Cook joined me for this discussion and we received quite a few homework submissions, which is always awesome. What’s not awesome is that I had to record this episode sick. Rachel was feeling under the weather as well, so we opted to hold off on news chat. But we still had a blast talking about this fantastic film. Oh, and check out the incredible GMK artwork to the left that was created by the talented John Bellotti Jr! We made another executive decision and have changed the next flick up on the discussion block! ‘Tis the season for spooks, so we are going to be producing a couple of Yokai specific episodes in October so the film we’re discussion is Takashi Miike’s The Great Yokai War (2005). If you don’t own this, it is available on DVD from Media Blasters. At one point, I know it was available “on demand” but I can’t seem to find it right now. Make sure to watch the film and send in your thoughts, questions and reviews before October 23rd. It’s a weird bizarre, yet fantastic film and I can wait to open the creaky door to October and really let my Yokai out!